Steadfast Raises Speed each time the Pokémon flinches. 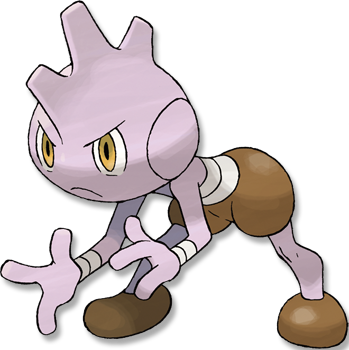 This Pokemon's Speed rises one level when it Flinches. Vital Spirit* Prevents the Pok�mon from falling asleep. This Pokemon cannot become Asleep. it will slug any handy target with� out warning. anyone. It has a very strong com� petitive spirit. Emerald TYROGUE become stressed out if they do not get to train every day. When raising this POK�MON, the TRAINER must establish a regular training schedule. FireRed Even though it is small, it can�t be ignored because it will slug any handy target without warning. Leaf Green It is always bursting with energy. To make itself stronger, it keeps on fighting even if it loses. Diamond/Pearl It is famous for its eagerness to fight and always nurses injuries from challenging larger foes. Platinum It is famous for its eagerness to fight and always nurses injuries from challenging larger foes. Heart Gold It is always bursting with energy. To make itself stronger, it keeps on fighting even if it loses. Soul Silver Even though it is small, it can�t be ignored because it will slug any handy target without warning. Black It is famous for its eagerness to fight and always nurses injuries from challenging larger foes. White It is famous for its eagerness to fight and always nurses injuries from challenging larger foes.